Our remaining days in Japan were carefully portioned out, and would be mostly dedicated to Tokyo and Kyoto. We had one day free to explore the region, though, and we intended to use every last moment of it. 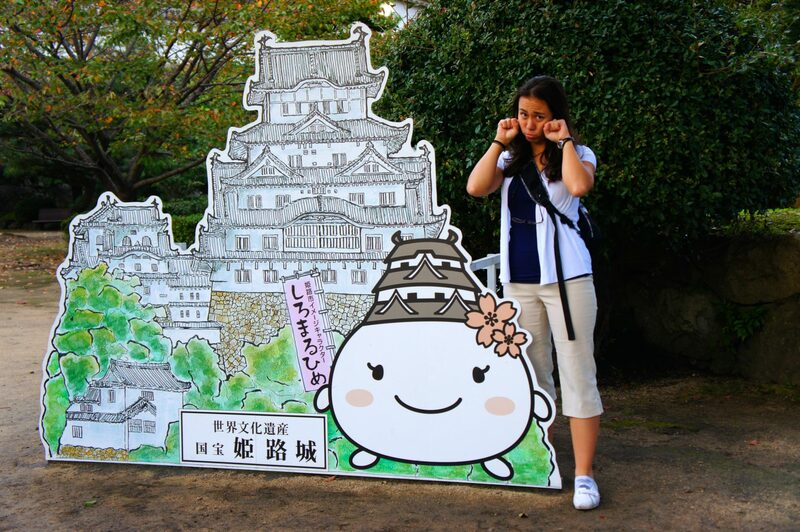 In one day, we would set foot in four cities, all in the Kansai region (in the neighbourhood of Kyoto). In case I am not being sufficiently clear, that day is the subject of this post. Hold on to your hats. 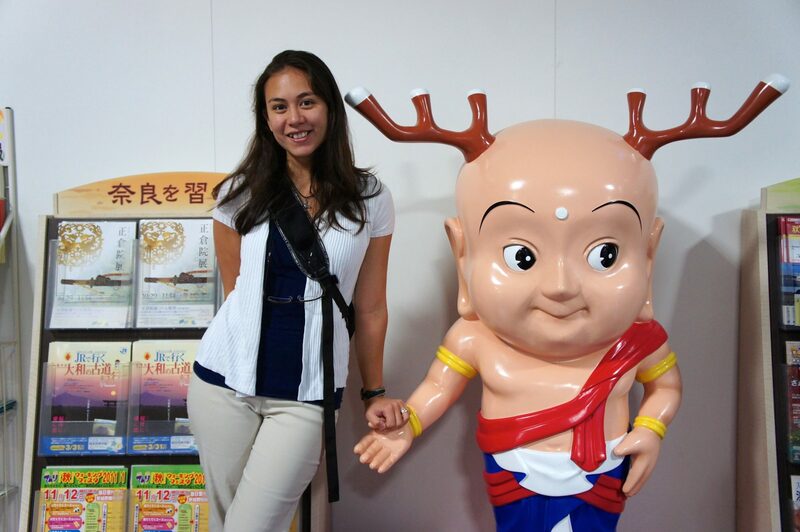 Our first destination was Nara. Luckily, the whole region is accessible by subway and light rail. We made a beeline for the Kyoto subway, where we did the usual subway thing. 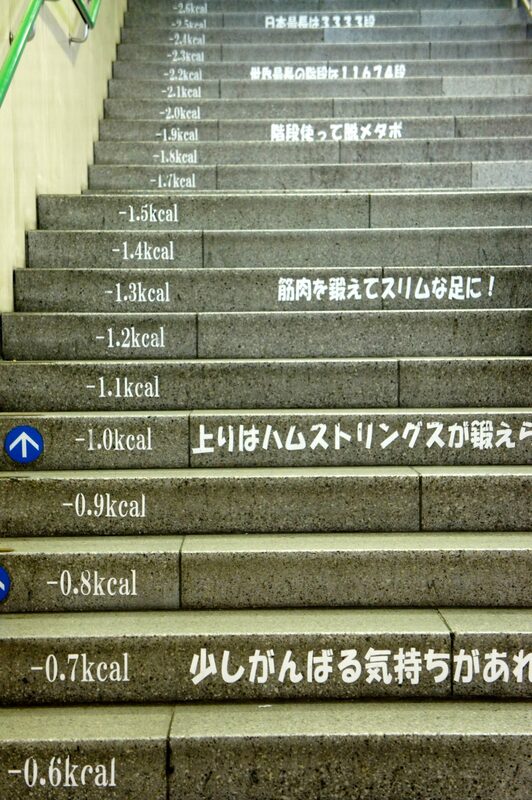 The stairs at the station came with a neat calorie-counting feature. Nara is swarming in deer. 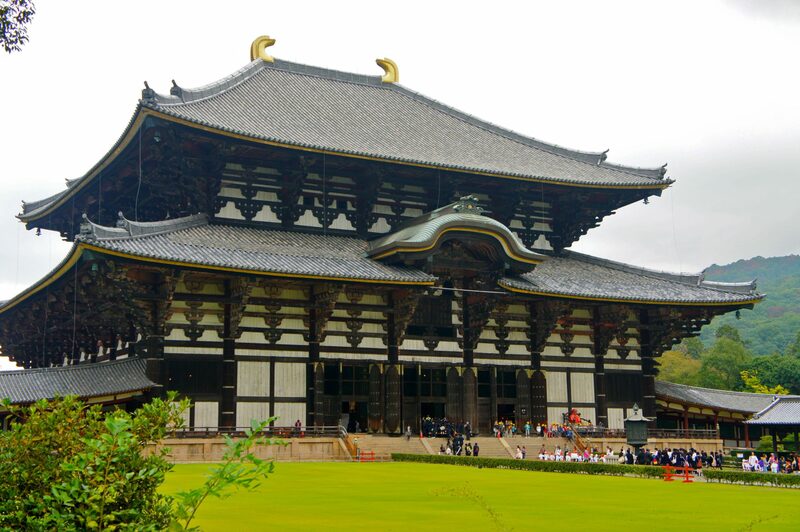 Or, at least, Nara’s major temple is — deer are viewed as divine messengers in Shinto Buddhism, so they’re allowed to roam about the grounds. Our love of temples and furry critters is well-documented, so we made haste to the ancient and imposing temple of Todai-ji. Kat’s travel guide had once again steered us true. The grounds surrounding Todai-ji was well-stocked with peaceful fawns (and the occasional brutish buck). This little guy has it all figured out, if you ask me. This dude was less aggressive than certain other bucks. Deer are not noted for their keen intellects. This guy was really mugging for the camera, and Kat was happy to oblige. The entrance to Todai-ji was also well-stocked with vendors selling tourists stacks of wafers. As it happens, deer love nothing more than wafers. They love wafers more than grass, more than freedom, more than each other, and more than self-respect would seem to allow. Deer go ga-ga for wafers, is what I’m saying. We were happy to feed their addiction. The deer were not shy about approaching wafer-laden tourists. Not pictured: the deer who confused my shirt tails for a novel form of wafer. Naka was waferless, and readily repaid the deer’s disinterest in kind. By the time that The Missus started feeding delicious, delicious wafers to the eager fauna, a buck had joined the group. This was the cause of some consternation for The Missus, as the buck was larger and much more aggressive than the fawns. The Missus, being accustomed to the hurly-burly of farm life, wasn’t afraid to throw in a few elbows to ensure that the gentler deer got some nibbles in. Anyways. We made our way to Nandaimon, the great southern gate past which the temple lay. Like many Buddhist temples, the gate was guarded by the Nio, a pair of statues of fierce warriors charged with defending the Buddha. Unlike most Buddhist temples, these Nio were 28 feet tall and 800 years old. Any cultural site worth its salt in Japan is packed with adorable schoolchildren. Shawn found the cleansing fountain much more interesting than the deer. Past the gate was a network of stone walkways, covered passages, and garden paths which lead to the daibutsuden, the Great Buddha Hall of Todai-ji. Tiny people included for scale. This is a big hall. A great one, even. 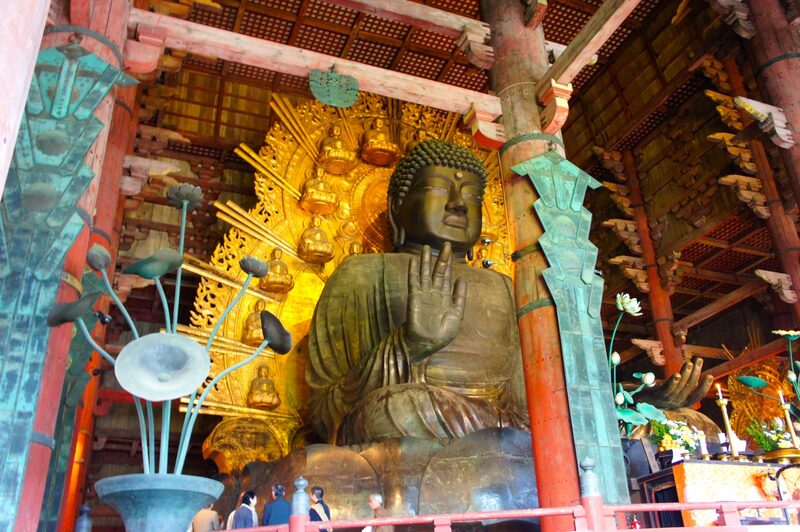 This particular daibutsuden happens to hold an especially impressive daibutsu — a giant statue of Buddha. This one is the world’s largest bronze statue of Buddha, measuring just shy of 50 feet tall (I would say 15 metres, but “50 feet” just sounds more impressive). It is no wonder that such a large hall is required to house it. Note the tiny people in the lower-left. The temple also housed several other statues with their own appeal; smaller golden Buddhas, wooden warriors and poncho-clad disciples rounded out the cast of characters. Note the scowling face located, uh, just below the belt. It is said that one can heal ailments by rubbing this statue of Binzuru and then rubbing the corresponding part of one’s body. The temple had staff on hand to handle popular tasks like handing out fortunes (for a donation), inscribing books (for a donation), and, of course, taking donations. [amelia]’s fortune advised that good things would happen on her travels and advised that she be modest. The Missus’s fortune advised that good things would happen on her travels and advised that she be modest. 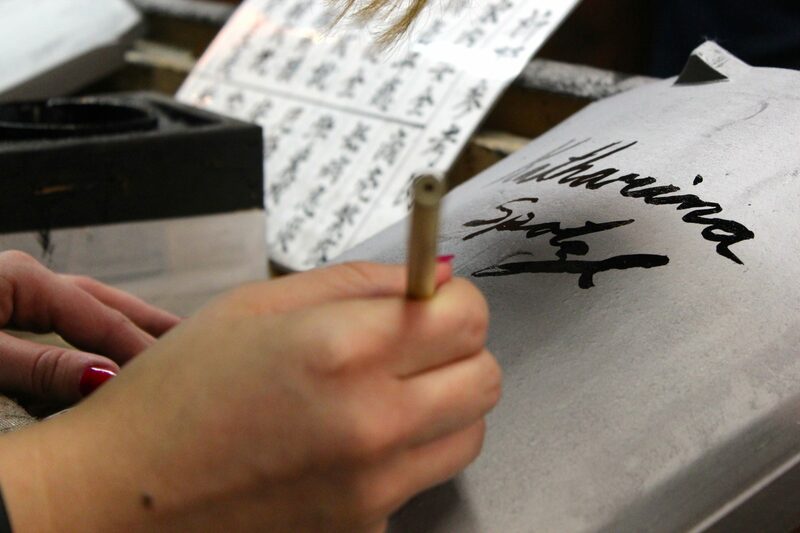 Patrons could also donate to a roofing fund and, in exchange, could paint a message onto a roof tile. Kat jumped at the opportunity. Unlike some tourists who had crafted messages of world peace and love (like Kent Le and Jessica Tang, an American pair ahead of Kat in line but far behind her in vision), Kat wanted to lave a message of real and lasting significance. Something that would stand the test of time, something worth believing in. Obviously her signature fit the bill. Having gawked at statues, cured our ailments, discovered our fortunes, and contributed cultural artifacts, we left the daibutsuden to explore the nearby museum and surrounding grounds. As one would expect, they were immaculately maintained. The hills by Todai-ji are covered in these markers. We left Todai-ji and headed for the subway. Our next destination was Himeji, home of Himeji Castle (widely known to nerds as a mediocre wonder in Civilization V). There’s a reason that I provided a link to Wikipedia’s article on Himeji Castle — we did not actually see it. 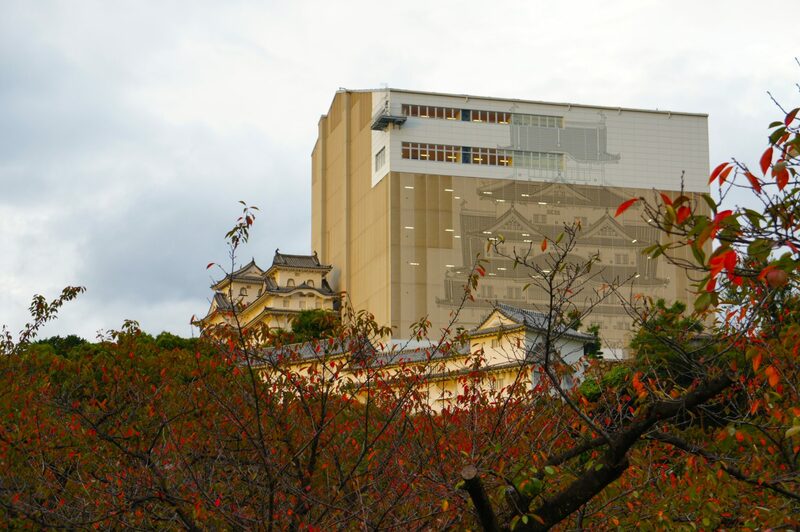 Himeji Castle was under repair, so it was in a box. Well, not a box as such – a protective screen. Anyways, the closest that we got to seeing the actual castle was the life-size picture of it printed on the protective screen. Himeji was littered with approximations of the castle, presumably to make up the lack of actual castle to disappointed tourists. We took advantage of these. The grounds of the castle were pretty nice. They had a bonsai tree display, which we found pretty exciting. 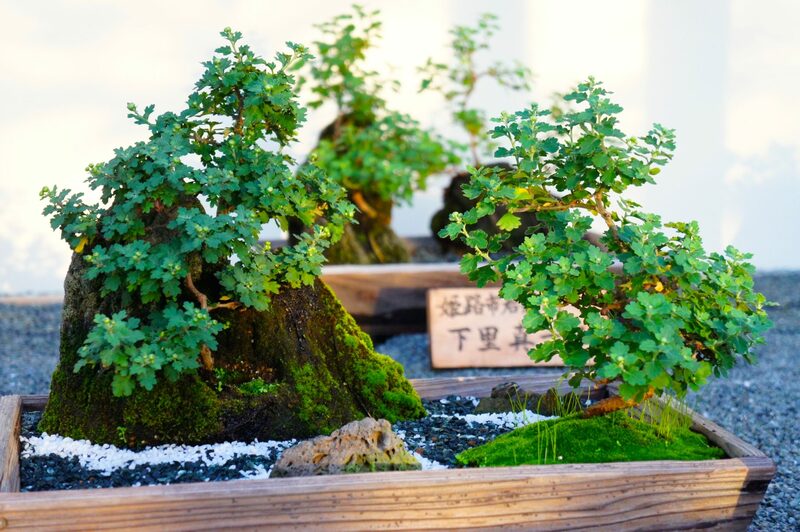 Who doesn’t love a good bonsai tree? It’s tiny and a tree! What’s not to love? Around this time the golden hour began to set in, so we spent a few minutes taking photos of the topiary and exploring the grounds. A tree illuminated by the pre-dusk light. These birds (geese? Swallows? I don’t know birds) played coy for a while, but we got ‘em. Time was running short, so we stopped by a Ben & Jerry’s store (hey, we gotta eat!) and made our way to Osaka. It was getting close to dinnertime (the ice cream was more of a snack), so once we got there we set out to find some grub. 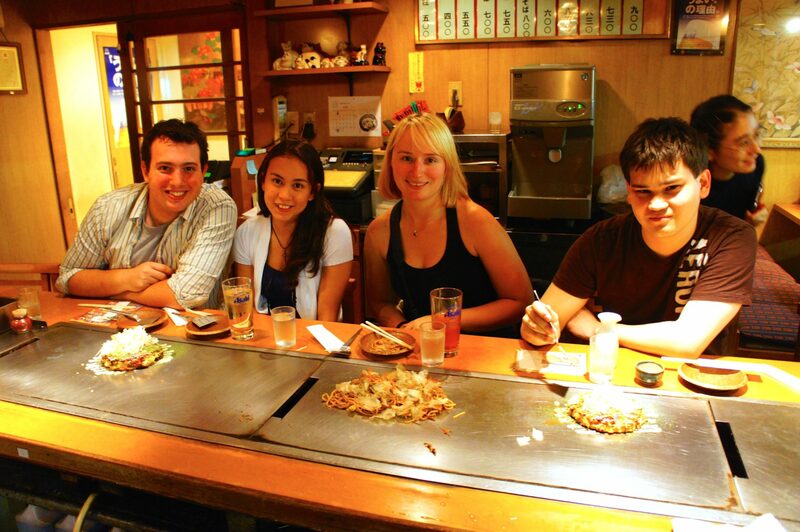 Now, we had previously been to Osaka, but this was Shawn’s first time. 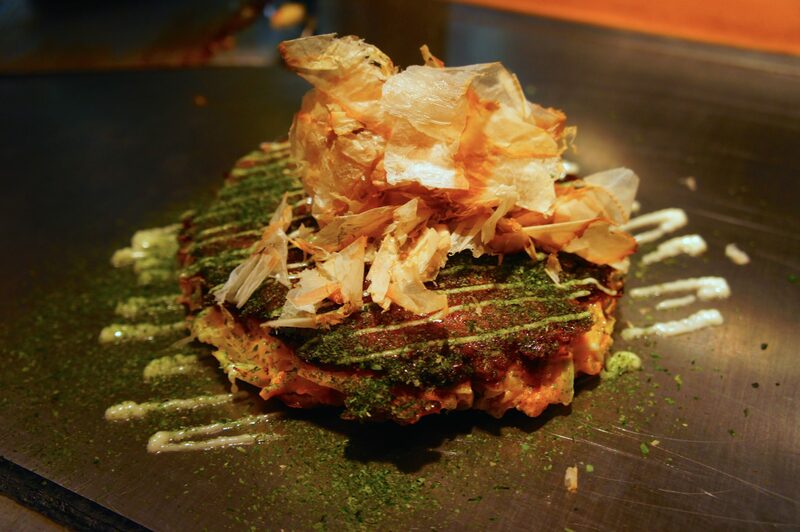 It only seemed right to introduce him to Osaka’s signature delicacy — okonomiyaki! Shawn quite liked his okonomiyaki. He even cracked a smile! Well, what passes for a smile where Shawn is concerned — he’s a stoic dude. Definitely fun to hang out with, though! We were hoping to make it to the ferris wheel near the aquarium before it closed for the night, but we were running behind. We soon realized that we weren’t going to make it in time, so we spent some time wandering the streets of Dotonbori instead. 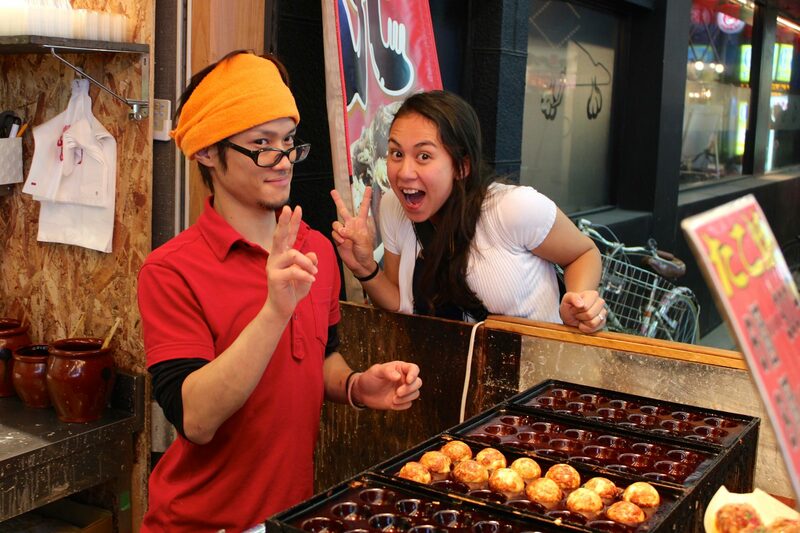 This gave us a chance to introduce Shawn to some more distinctive Japanese street food – takoyaki! We found a street vendor and bought a heaping helping. [amelia] was very excited to try takoyaki again. Her enthusiasm was infectious. Now, this whole time Shawn had been on the lookout for a specific type of vending machine — the kind with alcohol! This is not because Shawn is a boozehound, but rather because the whole concept of an alcohol-dispensing vending machine seemed so foreign to someone from British Columbia (which heavily regulates the sale and consumption of alcohol). So it was with great delight that we happened across just such a device! Fresh off our discovery, we ran across another novelty — a fellow dressed up as a wrestler (we think?) along Dotonbori’s main drag. Kat was intent on getting a photo with him. He was very accommodating. We did not find out the who, what, or why of this whole situation. We took a quick trip down the alleyway where (on our previous visit) we’d previously spied a dense concentration of love hotels. 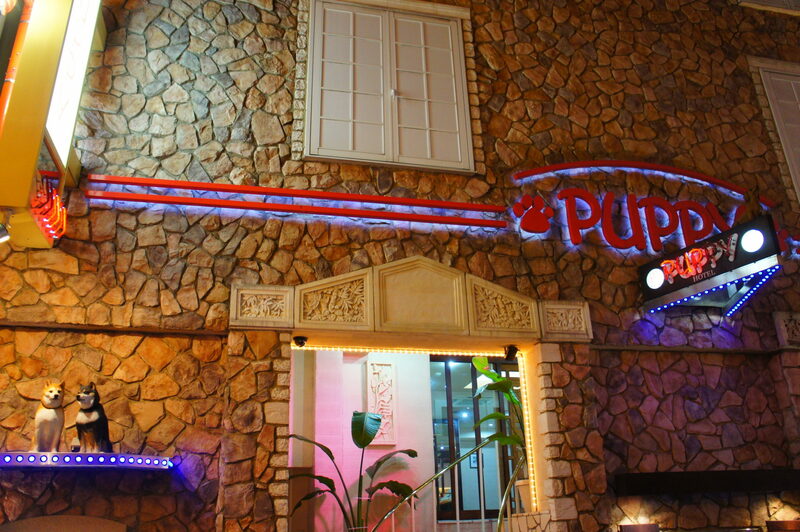 We were still curious about the interior design of the hotels — if the rooms are half as fanciful as the exteriors then the must be a real sight to see! This time, we (well, Kat and The Missus) actually wandered into a hotel with a facade covered in blue LEDs and asked whether they could see a room. They were told no; the innkeeper wanted payment for multi-hour block up front. We left, somewhat discouraged. Every hotel had a theme. This one was puppy-themed! We had lost track of time once again and realized that the last train back to Kyoto (our base of operations and our last stop of the day) was about to depart, and we were distressingly far from the station. We ran — literally ran — all the way back to the station and just barely made it on to the last train of the night. This is not the first time that we made our travel plans by the skin of our teeth, and it was not the last. But that’s a story for another night! We pulled back in to Kyoto, our fourth and final destination of the day. We rested up in anticipation of the adventures that the next day would bring. 28 February 2015 11 February 2018 Christopher ScottComments are off for this post.